Whether you’re flying for business or pleasure, one thing is certain: traveling via private jet should be luxurious. From the booking process to final landing, every moment should exceed quality expectations and guarantee satisfaction. This also applies to one critical flight element: private jet meals. In the United States alone, there are more than 12,700 private jets registered. That’s a lot of cheap peanuts and tiny cups of soda, right? Private jet meals are exactly as they sound: Delicious, first-rate fare served with a side of class and sophistication. Want to learn more about what you can expect the next time you pick up a fork in first-class? Let’s dig in! If you’ve ever been on a long flight with nothing but a cold, pre-packaged boxed lunch, or worse, a “platter” consisting of a few crackers and some cheese, you know: There’s nothing quite like a nice, hot meal. Passengers agree. In fact, recent studies show that eating/drinking is one of the top three in-flight activities performed by persons on long-haul flights, coming in at 40% right after watching movies (77%) and sleeping (69%). So what exactly will you be able to eat and drink on a private jet? We’ll get into that soon, but first, let’s start at the beginning. 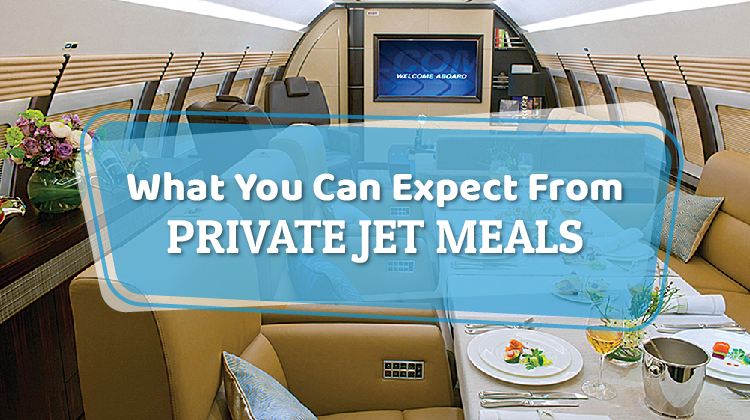 What differentiates a private jet meal from your typical airline cuisine? To put it simply, private jets literally “cater to the customer,” delivering everything from burrito bars to character-themed pancakes depending on client taste and preference, as well as location. From custom menu items prepared in onboard galley kitchens to a meal from your favorite restaurant anywhere in the world, if you can dream it, they can deliver it. The difference between these meals and the ones you’ll find on a commercial aircraft? One tastes like your mom’s leftovers (on a good day). The other tastes like your mom is in the back, cooking you up your favorite meal right on the spot. Option two sounds much better, right? Typically, high-end catering establishments will cater the desired meal at or near the airport location. Then, in-flight chefs and flight attendants will work to expertly re-prepare it to its exact presentation and perfection before serving it. As a result of this attention and care, ingredients are not only higher quality, but they are also are expertly combined and prepared to ensure a culinary delight. Forget those plastic medicine cups no bigger than a thimble, and silverware that breaks and splinters mid-bite. Private jet meals typically feature real glassware and cutlery to enhance and elevate the dining experience. While there may not be candlelight or bagpipes, the scene around a private jet meal comes pretty close, and it all starts with the table. Think back to the last time you flew commercial. Remember the pull-down tray on the back of the seat in front of you? The one you were expected to use for all your traveling needs, from eating to reading? On a private jet, this “table” is no longer small, nor does it crowd your personal space. Rather, most dining tables are spacious and sleek, providing ample room to spread out, socialize and dig in! Some jets also offer flower arrangements to sweeten the mood, and most even throw in the local newspaper so you really feel at home. So by now you know the food is warm, served in real dishes, and professionally presented. But how good is it for you? Surely something so indulgent can’t possibly be nourishing and substantial, right? While commercial airlines most are making strides to improve meal quality, including boosting transparency into ingredients and allergen information, the reality is that convenience is king. Minimal supplies and an ever-tightening profit margin mean that even the most well-intending carriers can find it difficult to meet, much less exceed, customer expectations at mealtime and are often limited by price point and availability. A bit of good news: Recently, some commercial lines have started working with internationally-renowned chefs to inject flavor, diversity, and healthy, high-quality ingredients into their meals. Yet, what is just now catching on in the commercial world has long been the standard for private jet meals. Onboard chefs are dedicated to crafting colorful, nutritious plates rich with flavor featuring locally-sourced and delivered ingredients. Curious to learn about some of the ways private jet charters source and select top-notch food for their discerning customers? Check out our insights here. Also, you know what goes great with that high-end popcorn and smoked almonds? No airplane bottle Jack-and-Coke here (unless, of course, that’s what you prefer). When indulging in private jet meals, you can often order signature, craft cocktails created with top-notch, flavorful ingredients heightened, not dulled, by the altitude. Want a little glass of champagne to top off the beginning (or end) of a fantastic trip? That’s available too. If you’re ready to sit back, relax, and enjoy a fine dining experience at 40,000 feet in the air, you came to the right place. We’re a private jet charter with a network of more than 9,500 aircraft and we can’t wait to find your perfect match. Request a quote today and let us book you a first-class flight to luxury. Anything we missed or that you want to add? Let us know in the comments below!